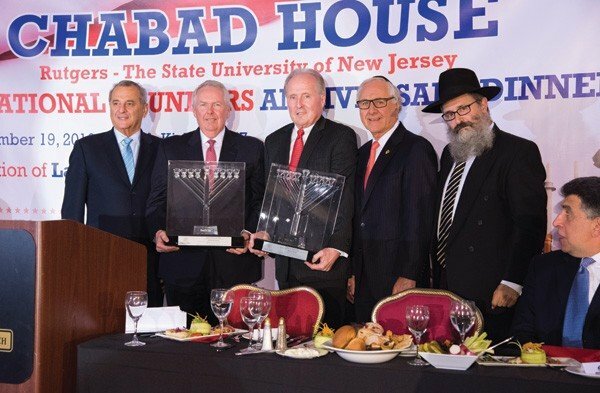 The Dec. 19 dinner at Chabad House on the university’s main New Brunswick campus drew 400 people to honor state Attorney General Christopher Porrino, State Police superintendent Col. Rick Fuentes, Port Authority of New York and New Jersey police superintendent Michael A. Fedorko, and New Jersey Transit Police chief Christopher Trucillo. 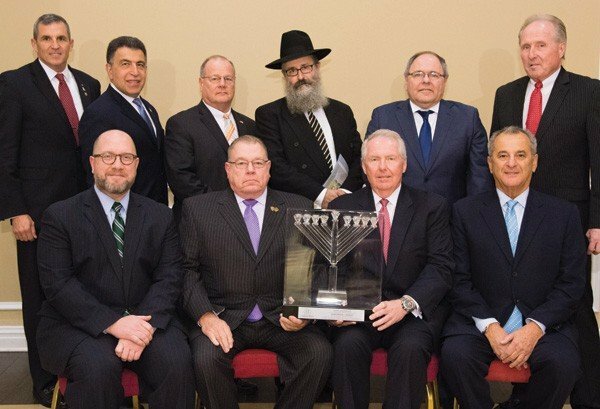 Honorees and dignitaries attending the dinner, seated from left, Attorney General Christopher Porrino; Port Authority Police superintendent Michael Fedorko; Dennis Kelly, and Chabad board chair Danny Kahane. Standing from left, Lt. General Michael Linnington; NJ Transit Police Chief Christopher Trucillo, State Police superintendent Col. Rick Fuentes, Rabbi Yosef Carlebach, Israel’s Consul General Dani Dayan, and Brian Kelly. The centerpiece of the evening was the close relationship Chabad developed over the years with law enforcement. Carlebach told NJJN that his involvement began in 1978 when he came to Rutgers and was asked to visit a Jewish inmate at the Trenton State Prison, now the New Jersey State Prison, an experience which “opened my eyes.” He began visiting men and women in prisons throughout the state. Former State Police superintendent Col. David B. Kelly, who died in 1997, asked him to work with the State Police on a voluntary basis, and former Gov. Jim McGreevey later officially appointed Carlebach as State Police chaplain. Dennis Kelly and Brian Kelly accepted an honor on behalf of their father. They spoke warmly of their father’s relationship with Carlebach, and Dennis recalled the two men spending hours talking and sharing a glass of vodka. When Kelly died, Carlebach was the sole speaker before thousands of police officers at a non-denominational ceremony prior to the official Catholic funeral. “My father was blessed with the greatest of Jewish friends, but Rabbi Carlebach without a doubt was my father’s greatest friend,” said Brian. They sat on a dais with, among others, New Jersey Office of Homeland Security and Preparedness director Christopher Rodriguez, Rutgers chancellor Dr. Richard L. Edwards, and retired Lt. General Michael Linnington, now CEO of the Wounded Warrior Project. While accepting his award, Trucillo said Chabad’s decision to honor law enforcement at a time when police are under fire because of a “false narrative across our nation” that they are the bad guys was especially welcome. Carlebach’s close relationship with law enforcement expanded to the Port Authority and NJ Transit Police. About 10 years ago, a passenger on a NJ Transit train reported that a “Middle Eastern-looking” man appeared to be handling something electronic. The information was relayed to the transit police and departments in Newark and Middletown, and the train was stopped. It turned out to be an Orthodox Jew putting on tefillin. The police, unfamiliar with phylacteries, called Carlebach who explained the practice and told them they need not be alarmed. Tanzman Foundation president Jeffries Shein, and Rabbi Yosef Carlebach. The incident, said Carlebach and Trucillo, led to the creation of the chaplaincy program for transit police. Rutgers Chabad and its affiliated rabbis now work with 25 law enforcement agencies, including the Monmouth and Middlesex county sheriffs’ departments, conducting Jewish cultural awareness training. That work has also extended to the next generation. Carlebach’s son, Rabbi Mendy Carlebach — who serves as Chabad’s administrator — is also an NJ Transit and Port Authority chaplain who befriended Linnington when he was commanding general of the U.S. Army Military District of Washington/Joint Force Headquarters, where the younger Carlebach attended chaplaincy training. A native of Cape May, Linnington has been a guest at several Chabad meetings and lunches with students, and once visited the Pentagon with Mendy Carlebach. “Mendy is my buddy,” he said to NJJN. Dani Dayan, Israel’s consul general in New York, told the crowd “there was no better time to honor law enforcement than on the eve of Hanukka” with its emphasis on a small number of good people triumphing over evil. The dinner raised $1.4 million for the world’s largest Chabad house, which includes Sephardi and Ashkenazi synagogues, and men’s and women’s dorms. The total amount raised included a $500,000 matching challenge grant offered by Jefferies Shein of Long Branch, president of the Woodbridge-based Marion and Norman Tanzman Charitable Foundation. The large sum is “a pre-Hanukka miracle,” Yosef Carlebach told NJJN, helped for the first time by social media as some of the 30 young members of the recently formed Rutgers Chabad Alumni Association contributed $10,000 and live streamed parts of the dinner, prompting alumni watching from across the country to donate as well. Erez Kahan, a 2013 Rutgers graduate originally from Teaneck and now living on Manhattan’s Upper West Side, said he attended and contributed because of the profound effect the organization had on his life.